Finally got back on the pedals today! Figuring out the geometry on the bike at In-Shape was a wild guess and using the toe cages with straps was a blast from the past, but it didn’t stop me from laying down some watts. I don’t have a power meter on my Falco V so it was nice to see what I could generate for a change. (I really need to invest in a computer for my bike I guess.) I felt really good after spinning my sore legs out from the past two days of Focus T25. So much so that I decided to get on the treadmill and see how the old running legs were doing. I really don’t like running on a treadmill, or a stationary bike for that matter, but it was hot outside and I need to keep the sun off of this new skin as much as possible for a little while. So treadmill it was. I have to admit, I felt a little weird running at speed when to my left and right were people barely moving. I often wonder if people really think that walking 1.5 mph on a treadmill actually does anything for them at all. I know that everyone is on their own health and fitness journey and I have no idea what people are going through so I am not going to be judgmental. Believe me, I am the last person to be judgmental on anyone, I took 20 years off of focused health and fitness. Maybe they were rehabbing an injury or something valid like that and ultimately, at least they are doing something, right? But still, turn the speed up a bit and break a sweat! If they were laboring and walking with purpose that would be one thing, but when someone is walking on a treadmill like they are taking a slow stroll in line at Disneyland, then I start wondering. It’s moments like this that I am so thankful for the Beachbody Suite of Programs. The DVD’s focus you on a scientifically developed regiment that is designed to give you healthy results as fast and safely as possible. No guessing! Pretty cool stuff! All I know is I am looking forward to some P90X2 Yoga tomorrow night! Hi! I know. I know. I have not posted in a little while. No real training to report on for the past week and I have not been eating that great. This holiday season has been a bit more difficult for me to get into, for a multitude of reasons, yet I have been doing my best to keep the spirit alive for the kids. All I can do is love them with all that I am and know that they will appreciate their Christmas experience as much as I did when I was a kid. So with that being said, and with today marking one week until Christmas Eve, I am declaring this week The Christmas Crunch! The Christmas Crunch is seven days of eating better than I have been and doing something active every day (a Beachbody workout,yoga, swimming, cycling, running, or a mixture of any of those) I am going to get back into the swing of things, conquer my Holiday Blues, and get this body moving and ready to train hard for the 2014 Triathlon Season. Any one else up for the challenge? How many of you went a little overboard with the food consumption this past weekend? I know I sure did. Did you at least get in some workouts to offset the extra calories? No? That’s OK, I didn’t either. But you know that doesn’t have to continue through Christmas and New Years right? Its super easy to get caught up in the Holiday Season and forget that all of those yummy desserts and extra helpings of delicious delights start adding up to extra pounds at the scale. This doesn’t have to be a problem though. The Holidays are a great time to renew commitments to yourself and others to eat a little healthier and add some fitness back into your daily routine! Time to hang up that holiday apron and get moving again. Start walking, go to the gym, pick out a new Beachbody program, whatever interests you make the decision to start Today. Do you want to feel better? Do you want to have more energy? Do you want to look better in your clothes, or even better out of your clothes? Its time to take control, make the decision, and do something about it! I am going to workout everyday and make better choices on my nutrition, are you with me? I am here to help you find something that will work for you! Comment here or contact me and lets help motivate each other to make a difference! In the Summer of 2011 I was 226 lbs and around 30% body fat. Cutting out alcohol in September 2011 helped a little. By January 2012 I was 206 lbs and 24% body fat. I had quit drinking soft drinks and just started the P90X 90 Day Challenge – Working out and drinking Shakeology every day. 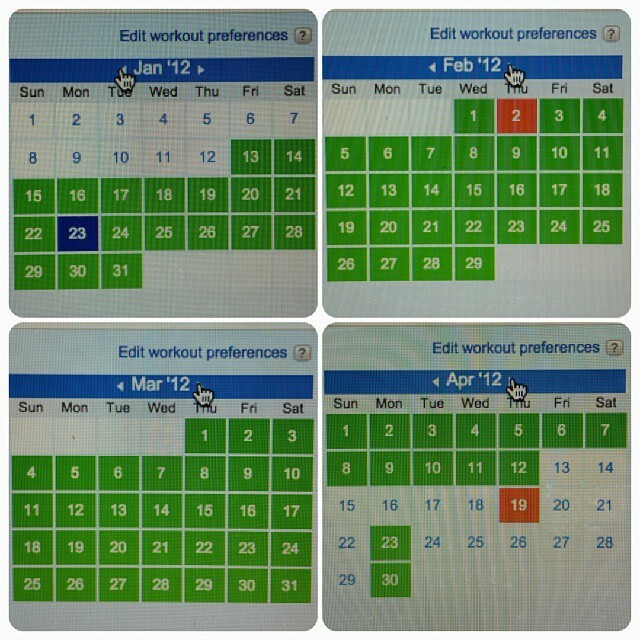 After 90 Days (April 2012), I dropped down to 180 lbs and 11% Body Fat. Within the next week I lost another 5 lbs and was at 10% body fat. I started P90X2 and strengthened my core and achieved a more chiseled look by July 2012 and was down to 166 lbs and 7.5% body fat. Today I am sitting at the same weight I have been since July. 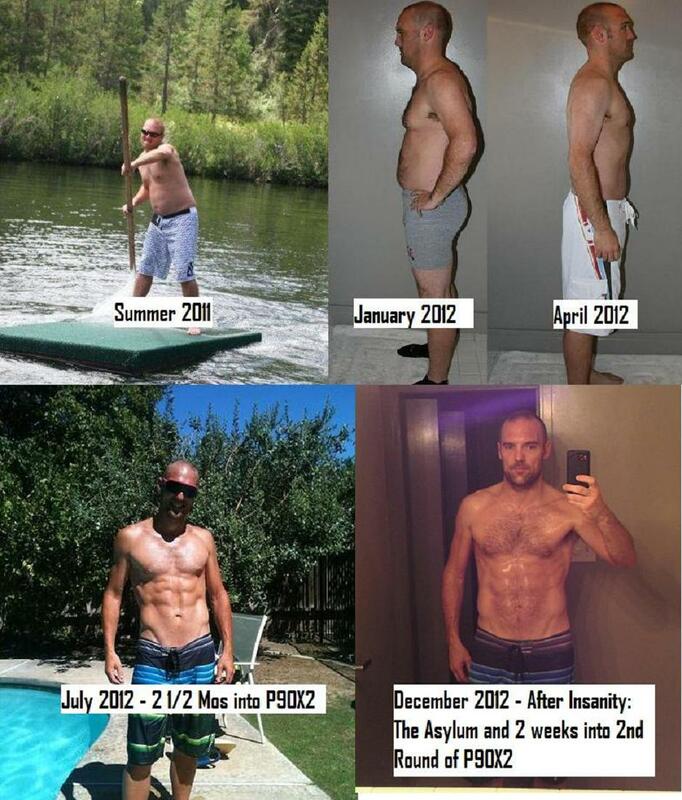 It has all been possible through the Beachbody programs with their nutrition and fitness. I made the decision to make a change last New Year’s Eve, bought the program, and committed to the first 90 Day Challenge. I promise that if you make the same choice that I did and really commit to this thing for 90 Days you WILL achieve results. And, if you continue with the program you can keep those results and have fun doing it. Say Yes to your life and make the decision to have more energy, move easier, feel better, and just be a healthier you. My New Year’s Resolution is to help more people achieve their health and fitness goals. Will you be one of those people? Let me know that you are responding to this call and I will pledge to you my full attention in helping you achieve your goals you set today! I was going to say tomorrow, but I guess it is already here. So TODAY I am starting my second round of P90X2. This will be at least a 13 week Challenge, maybe longer? It was a little less than a year ago that I started my journey back to becoming a healthy person again. Beachbody provided the avenue for me to do this successfully and so with Beachbody I am staying. P90X got me the major transformation and P90X2 took me that next step forward to be competitive in a few triathlons this past season. Today I start it all over and I am going to attack P90X2 with definite purpose. The triathlon season starts back up in March for me and I am so excited for this opportunity to be where I need to be in my training once the 2013 season hits! So just like I did with the Asylum, I will be posting my meals and training in a daily log format. So follow me on this fitness journey over the next three or so months. I will do what I can to make it interesting. Who knows I just might inspire a few people to take on a Challenge of their own? I hope it’s you! Wouldn’t it be nice if there was a magic pill that we could take that would produce results while we sleep? It would burn excess fat, build lean muscle, give us super human strength, provide us with speed and stamina, and while its at it, might as well make us smart and good looking too right? I am going to go out on a limb here and say that there is no such product, but yet billions of dollars a year are spent on products that claim to provide people with one or more of these results! Maybe its just me, but it seems that people are willing to spend more time, money, and effort trying to get out of doing something than if they were to just do it and get it done. They must try the latest gimmick, apparatus, 7 Minute Abs, 6 Minute Abs, this chair, that diet; do people believe that they are entitled to look like they eat healthy and spend four hours in a gym a day without some basic effort? Entitlement is Paralysis as far as I see it. You can believe all day long that you deserve that promotion at work, but you know that unless you actually enjoy what you are doing and do the best you can with your present responsibilities, then you will never move forward. So why do people believe that they will become healthy and fit without putting in the work as well? I have found that the reason is “with success comes responsibility”. Once you achieve great results you become expected to maintain those results. People watch to see if you can keep results, or if what you did may be just a flash in the pan. This may be true to an extent, but people are human and life sometimes gets in the way. The best thing about getting results is knowing that if you put forth the effort, you can always get them again if what you did is reproduce-able. If you slip a little bit, its OK. Remember: All we can do is learn to do our best given any situation and enjoy life along the way. Otherwise, what is the point of living? This is my transformation story: The picture above is of me, the one on the left is what I looked like up until around September of 2011, the one on the right was me a couple weeks ago. Before, I enjoyed good beer, ate way too much food, and hardly ever exercised, as you might have noticed. Unfortunately, I didn’t think there was anything wrong, I knew I was a little overweight, but I looked around and I thought I looked better than average. Well maybe on the outside I felt I was still better than average, but on the inside I was a mess. My blood work came back and I had high cholesterol, triglycerides were ridiculous, and blood pressure was higher than normal. Physically I was in the hole. How do you think I was doing mentally? Yep you guessed it, emotionally and motivationally I was a wreck. I was just going through the motions, and believe me, when you are in poor health, everything is in slow motion. I couldn’t stand it anymore. I was done feeling sorry for myself. No more unhealthy me. Being a competitive athlete in my younger years, I wanted to get back to a place in my life and health where I could run again, but that would take me losing at least 46 pounds. I am six foot tall and in September I was 226 pounds and probably around 30% body fat. First things first, I quit drinking excess calories such as alcohol and soft drinks and started exercising a few times a week. I had some success and started feeling better about myself, but I like so many people was still looking for that magic pill. I thought that I didn’t have enough time to workout, nor did I feel I could spend the time to cook healthy food for myself. Boy was I wrong. I found out about Beachbody and their Beachbody Challenge, 90 days commit to drinking Shakeology and doing a work out every day at home. I thought this is what I have been looking for, a chocolate shake everyday and I get to workout in my own space where I don’t have to worry about people seeing me do push-ups from my knees. Sign me up! On January 11th, 2012 I weighed in at 206 pounds and 24.1% body fat. I drank Shakeology every day and loved it. I felt good instantly, reduced my coffee intake drastically, and looked forward to my new breakfast with eagerness. I started pushing play on my DVD everyday and did the workouts religiously. I chose P90X as my workout program because I had heard great things about the format of the program and how quickly people were getting results based on the effort they put in. I also changed my eating habits. No longer did I eat anything that was modified, processed, or artificial. This was of paramount importance to get the noticeable fat loss that hides the body’s more famous muscles. Without nutrition there can be no six pack (as you find out when you get older). After 90 days I was 180 pounds and 11% body fat. I was hooked! I decided that I was ready to make my comeback on the Triathlon circuit. A few weeks later I started P90X2. When I started I was 175 pounds and 10% body fat. This program was developed to build upon the results from P90X. 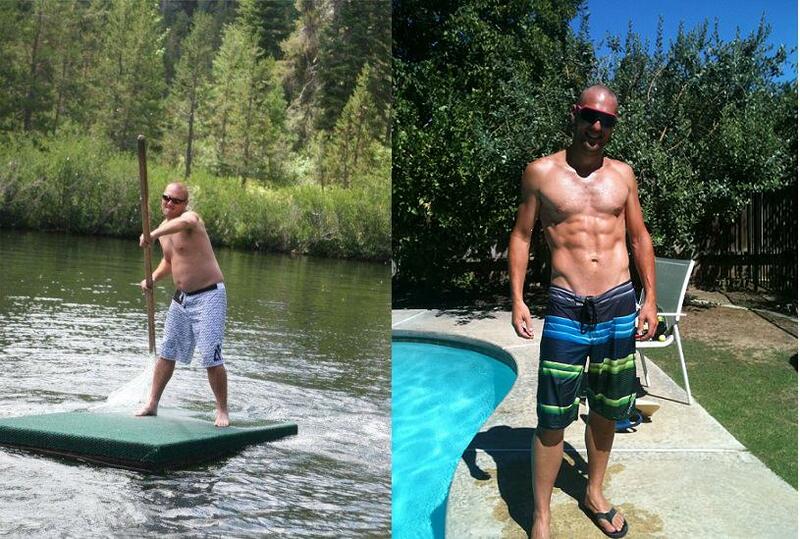 I started swimming, riding, and running as a supplement to the P90X2 workouts. After 14 weeks, I am 166 lbs and 7% body fat. I recently went in to have my blood work taken again and I have lost 90 points on my Cholesterol and everything else is within normal ranges. I feel amazing. I competed in my first Triathlon in 18 years this past July (Castaic Lake Sprint Triathlon). Tomorrow I am going to compete in Race #2 of that Triathlon Series. It is my hope that since this past month I completed the Performance Phase of P90X2 that it has helped to grow me as an athlete. I definitely feel faster and my training times have improved, so lets see if I can put them all together. The whole point here is that there is no magic pill to get results. You still have to put in the work if you want the rewards. The smart thing to do is to do things that are proven to work. Commit to regiments that are reproduce-able. Be smart about your nutrition. Have a want and desire to do your best in any situation. You will get results if you follow this advice. Here are some links that helped me and I know they can help you succeed as well. If you are open to it, I will help you achieve your goals, no matter how lofty you feel they may be!